Design your own personalised throw pillow for a unique way to show off your photos, and add unique style to your room. You can print your designs on both sides or choose from five lovely backing colours. Available in three sizes and made from luxury Soft Velvet, they're a dream to rest against and cuddle up to. Enhance your lounge or bedroom with wonderfully soft velvet custom throw pillows. Designed by you, you can showcase your individual style and enjoy looking at your favourite photos all day long. The front is printed as standard, and comes with a choice of either ivory beige, soft pink, pale blue, grey or white for the backing colour, or go for double-sided printing. This allows you to print all over with your special memories. Lovely quality cushion, clear image. Product quality was great. Prompt polite service. Found website teeny bit tricky when trying to swap my image though but got there. Relative loved the product (given as a gift). I ordered a cushion with a collage of photos on both sides for my sister's 40th. I was very impressed with the finished product. There were some photos that were not that clear, but to be honest that was because there were a lot of people in them, and as I had a fair number of photos it was small to be able to fit in. Postage was smooth, and ordering was easy. I would use this company again. Your personalised throw pillow has a three for two offer, so buy two and add another one to the basket for free. Expertly printed and handmade to order in London, UK, your personalised throw pillow is a truly bespoke gift. Your photos are printed onto silky soft velvet using a specialist process that bonds the ink deep into the fibres of the fabric creating a lasting print. The velvet is cut to size and filled with a thick, plump feather or poly padding to guarantee comfort and cosiness. Our seamstresses hand sew your custom throw pillows together, finishing with a contemporary heart pendant zip or a plain zipper. Using the design tool you can easily make your own colourful collage throw pillow. Press start design above, upload a selection of photos, and you can automatically generate a collage pillow. 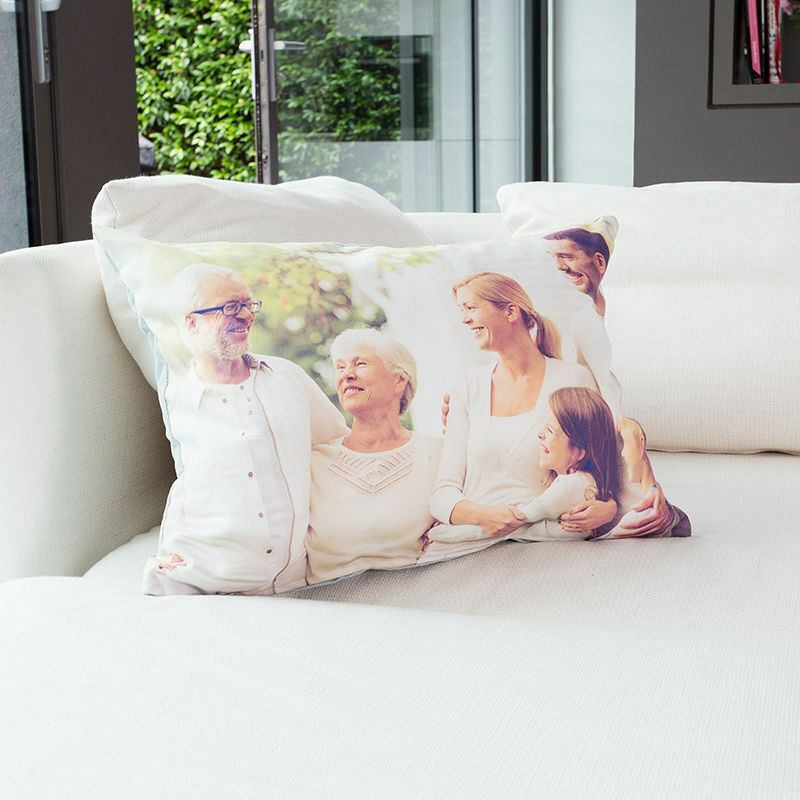 Select from one of the ready-made montage styles, or edit and rearrange the photos yourself for a one of a kind personalised throw pillow. If you opt for single-sided printing, you can select from five backing colours for the reverse; soft pink, pale blue, ivory beige, grey or white. Don't rehash the same gift idea as last year and create some truly special for your other half on your anniversary. Select your favourite photo together and add a heartfelt message to show how much you care. It's an everlasting gift that can be a constant part of your life, even when you move homes etc. Make your Christmas a customised one and include bespoke throw pillows around your home. Printed with magical winter scenes and festive photos of the family, it's a great idea to ensure everybody is cheerful and full of holiday joy. For a big birthday, commemorate it with a sentimental personalised throw pillow. Print photos from the past for a nostalgic touch, and let the birthday girl or boy reminisce on the memories of their life.